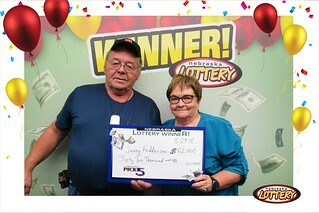 Jerry Feddersen of Grand Island won $62,000 playing Nebraska Pick 5 from the Nebraska Lottery. Feddersen purchased his winning ticket from Pilot Travel Center #901 at 5085 Buffalo Creek Road in Elm Creek. The ticket contained one play with the winning numbers (02, 03, 04, 23, 25) from the August 19 drawing. Feddersen said he’s a regular player of Pick 5, Powerball and Mega Millions, but this is the first time he’s hit it big. Feddersen said they’ll be using the winnings to pay off their camper and their car. Even though he hit the jackpot, Feddersen said he’ll probably keep playing Pick 5. “I’ve got a couple tickets in my pocket right now,” he said.